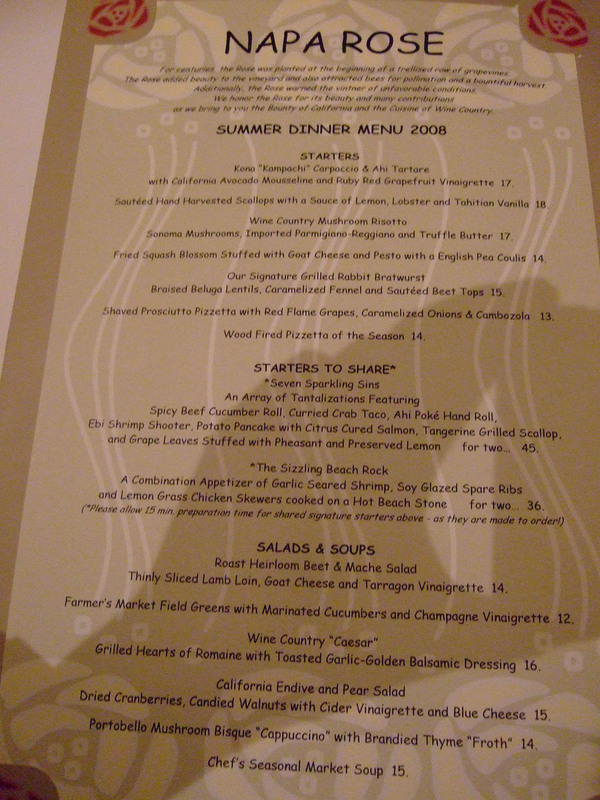 Ah...my third posting (and I think my fourth meal) on Napa Rose (see my previous ones here and here). 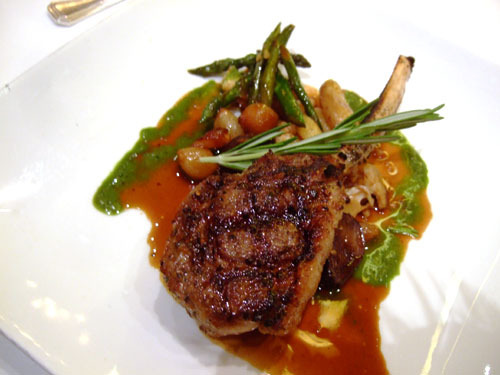 I'm not sure exactly what keeps me coming back, but I highly suspect that it's because Napa Rose is one of the few fine dining restaurants in North OC. I think I've covered the decor enough in my previous posts, so this time I'll focus on the mini wine cellar near the entrance of the restaurant. 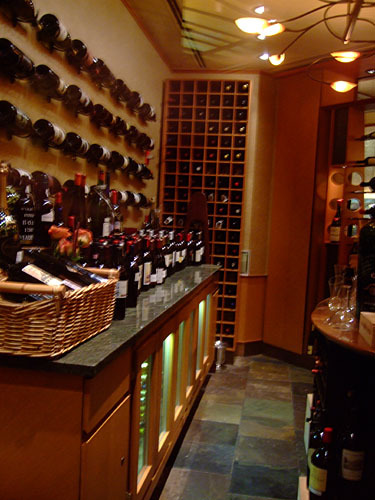 This is just one of three places Napa Rose stores wine. 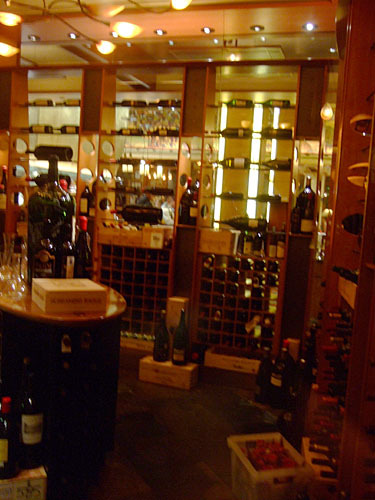 The restaurant also has an underground cellar on site, as well as a remote storage facility in South Orange County. The collection shown here houses some interesting bottles, including many signed ones and big-ticket bottlings such as DRC. 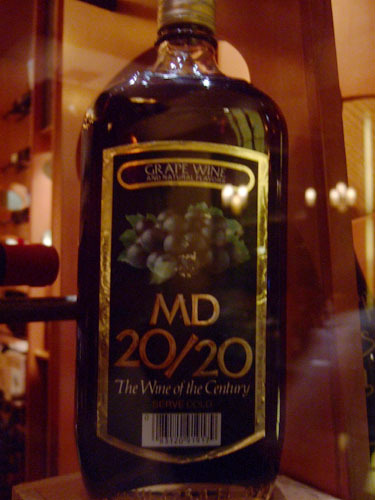 Of particular note is the MD ("Mad Dog") 20/20 pictured above, perhaps the finest example of American bum wine. I'm definitely going to order it next time! The menu is set up in a straightforward manner: apps, mains, sides. Now normally I'd go for the Vintner's Table menu, but felt that four courses just wasn't enough. The solution was to request a special, seven-course tasting menu instead. The price for this custom creation, if I recall correctly, was around $120. Click for larger versions. Since I had a mojito on my most recent visit here, I decided to mix it up with a Tom Collins [$9.50] (Tanqueray gin, lemon juice, sugar). 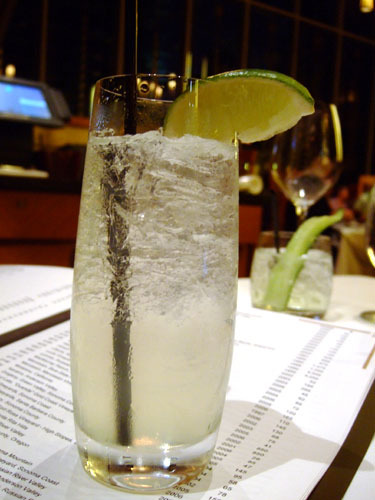 Dry and refreshing, it was better than the last Tom Collins I had, which was at the 5x5 dinner at Providence. 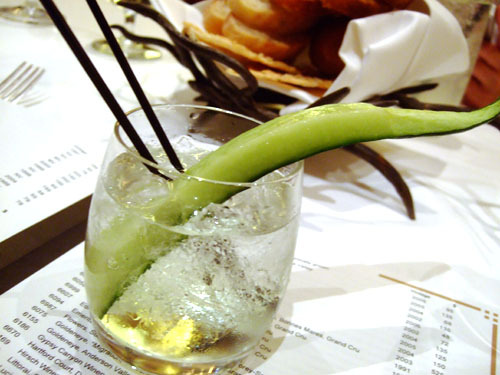 After having a great experience with a cucumber martini last time, my dining companion ordered a cucumber Gimlet [$8.50] (Skyy vodka, lime juice). I'm not sure anything "cucumber-y" was done to the drink save for the large slice of the vegetable, but it worked out well enough. 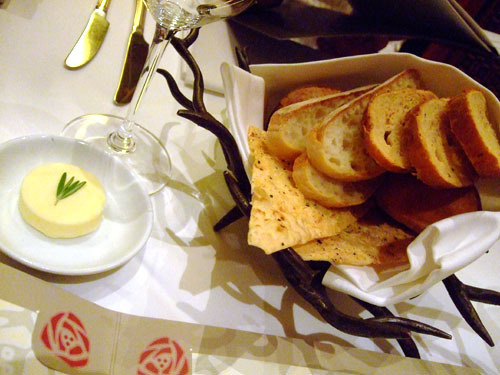 The bread assortment seemed identical or nearly so to those of my previous visits. A nice selection, with the crispy flatbread being my favorite once again. 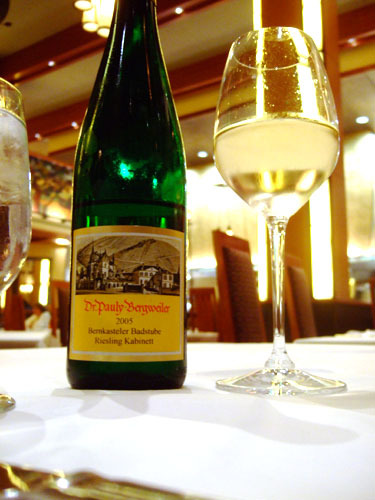 Riesling, Kabinett, Dr. Pauly Bergweiler, Bernkasteler Badstube, Mosel-Saar-Ruwer, 2005 [$57.00] - Pretty much exactly what I expected from a German Riesling Kabinett. Off-dry, with delectable notes of stone fruit, flowers, and citrus, giving way to a surprisingly long, luscious finish. 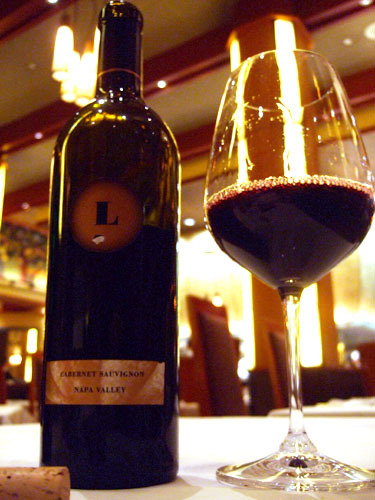 Cabernet Sauvignon, Lewis Cellars, Napa Valley, 2001 [$125.00] - Typical flavors of dark berry, spice, and perhaps a hint of chocolate, leading to a bit of tartness on the finish. Good, but unspectacular. A great price on this one though, pretty much retail. Mint, Balsamic Vinegar Gelée, Feta Cheese. 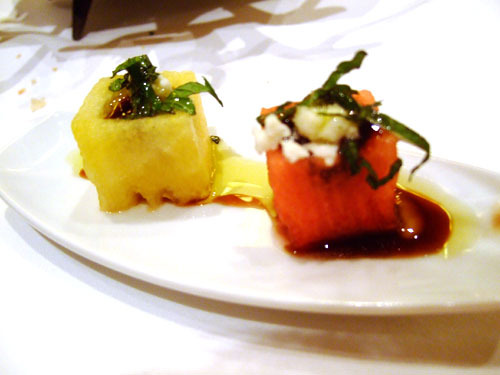 My initial impression here was that the flavor pairings were a bit odd, but once I tasted it, I found that the watermelon was a great canvas on which the contrasting flavors of sharp cheese, rich balsamic, and cool mint could present themselves. Light, refreshing, and a great way to kick off the meal. Heirloom Tomatoes, Corn, Crab, Cucumber Relish. 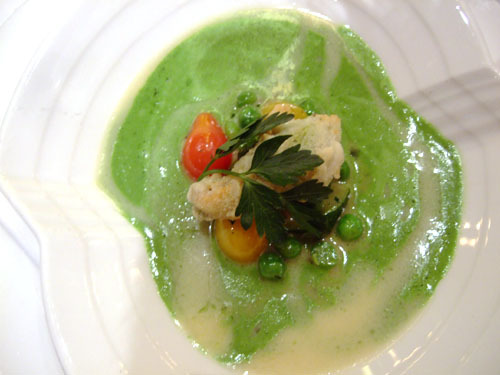 The second amuse was actually the soup special of the night. 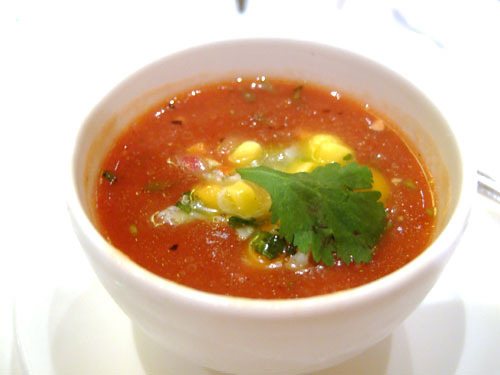 The delightful chill of the soup was followed by a hint of heat on the finish, while the corn, crab, and cucumber added some great flavor and texture complements. Very nice. 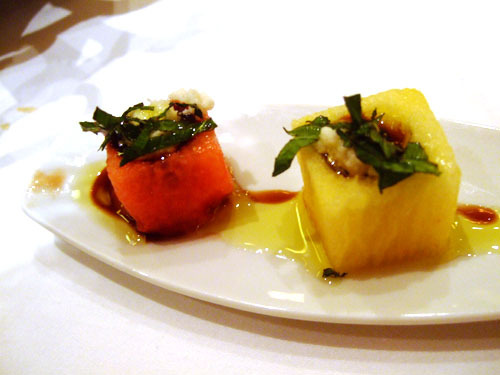 With California Avocado Mousseline and Ruby Red Grapefruit Vinaigrette. 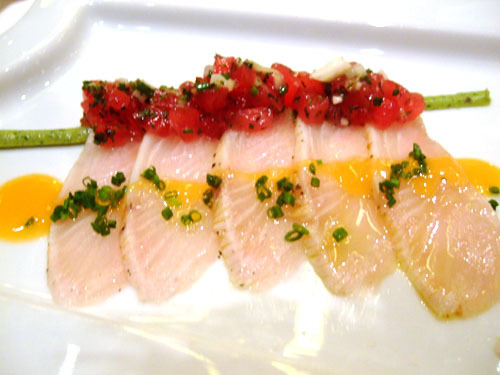 Though the kampachi wasn't a stellar example of the fish, it served as a good backdrop to let the flavors of the mousseline and grapefruit vinaigrette shine, making this a very balanced dish. The tartare was interesting as well, and since it was more of a condiment than a main focus of the dish, it could've easily have been confused for a pico de gallo salsa! Stuffed with Goat Cheese and Pesto with an English Pea Coulis. 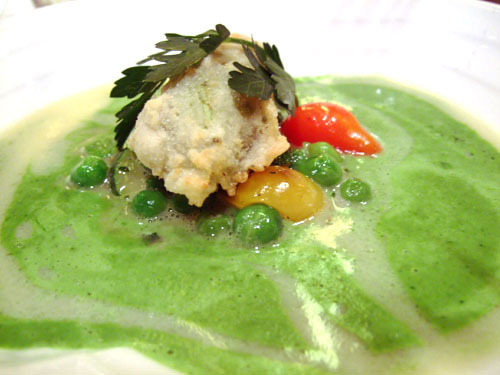 Nice contrast here between the fried blossom and the thick coulis, and I really liked the addition of peas and cherry tomatoes to the sauce. Quite a bit better I thought than the squash blossoms I had at Shiro. 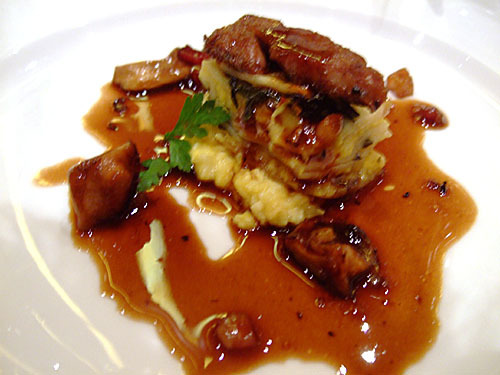 Topped with Duck Confit with a Sauce of Applewood Smoked Bacon and Sonoma Mushrooms. 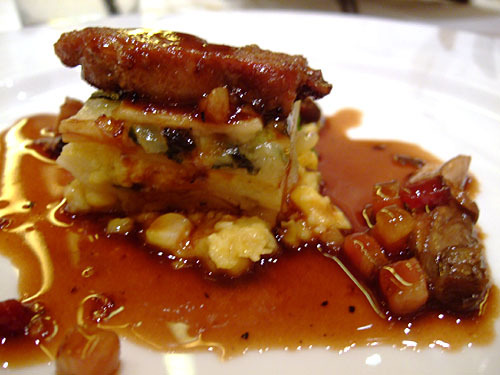 I felt that the strongly-flavored troika of duck confit, bacon, and mushroom overpowered the subtleness of the lasagna, which should've been the star of this dish. One of the weaker courses of the night for me. 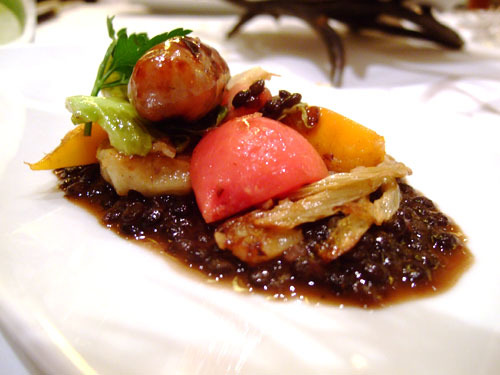 With Braised Beluga Lentils, Caramelized Fennel and Sautéed Beet Tops. 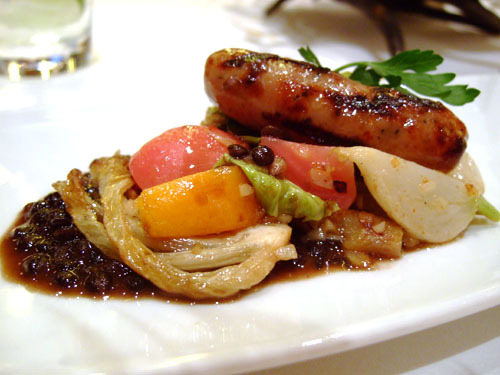 As was the case on my last visit, the bratwurst was excellent and left me wanting more. On that occasion, I found the accoutrements a bit overpowering, but this time, the veggies were a pleasure to eat. I wanted more rabbit though! 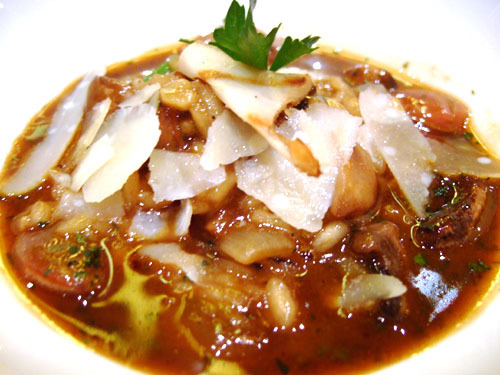 With Sonoma Mushrooms, Imported Parmigiano-Reggiano and Truffle Butter. 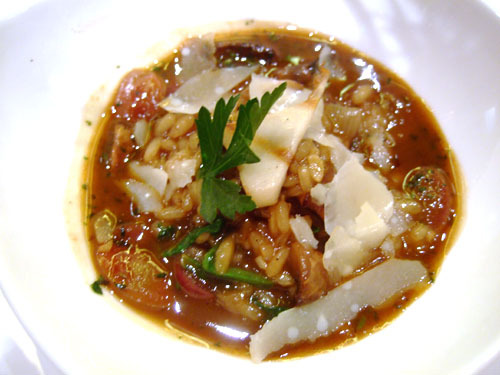 I had an extremely similar risotto last time I was at Napa Rose, the only difference being a lack of truffles (replacing them with truffle butter, perhaps a cost-saving measure?) here and Sonoma mushrooms instead of Chanterelles. As such, the experience was nearly identical. Good, but I would've preferred a lighter sauce. 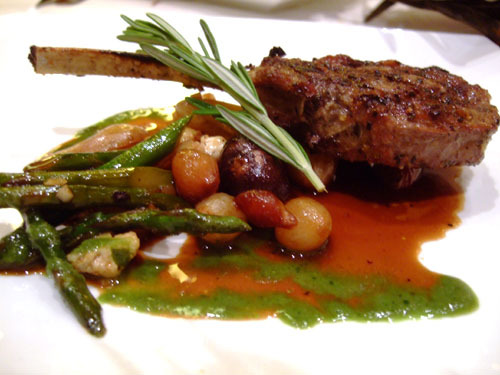 With Marble Potatoes, Asparagus, Cipollini Onions and Summer Basil Pesto. 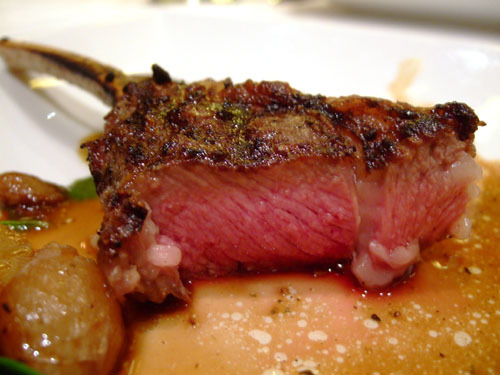 A very nice interpretation of lamb, juicy and succulent, with the lemon and rosemary providing an extra boost to the meat's natural flavor. The vegetables provided a suitable foil to all that richness. 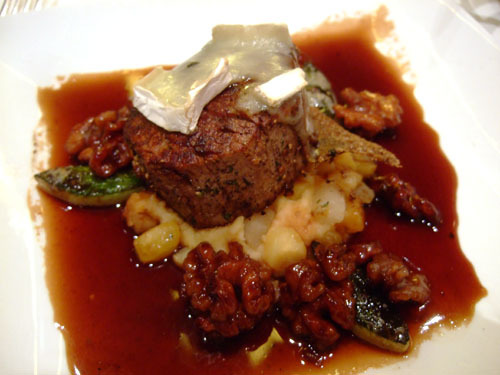 Topped with Melted Brie with Roasted Walnuts, Sun-Dried Cherries and Cabernet Sauvignon-Cherry Essence. 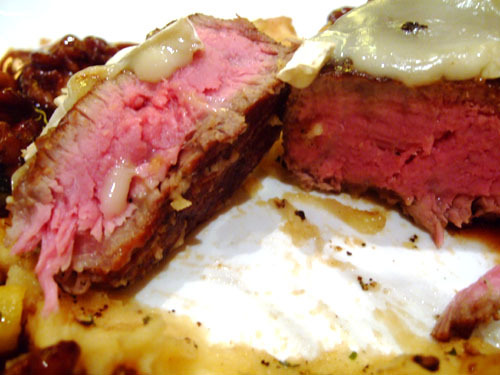 A very competent filet, one that could've easily stood on its own and wouldn't have seemed out of place at most any steakhouse save for CUT. 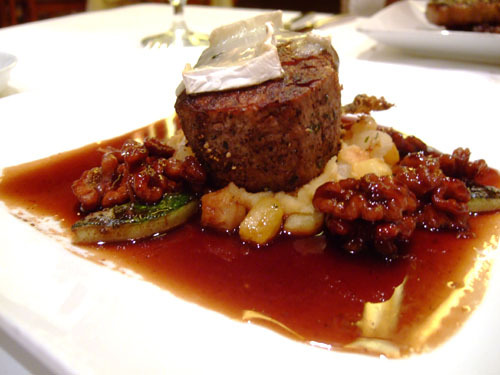 Very tender, no gristle, and quite flavorful for a filet. The accoutrements were almost superfluous. 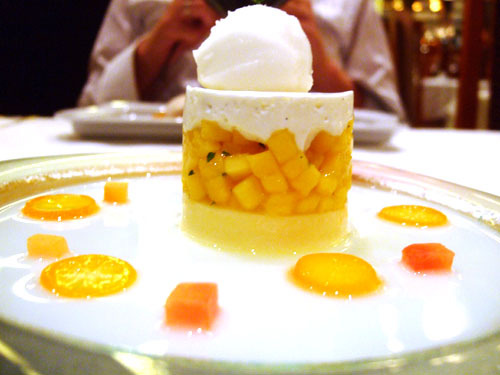 Citrus Granité, Kumquats. 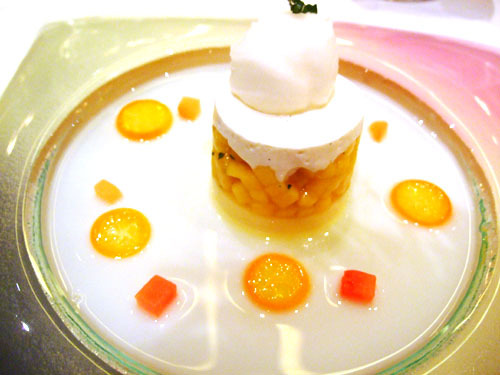 On one hand, you have the parfait itself, which had a very light, subtle peach flavor. On the other, the granité provided a chill tartness while the kumquats added a rich sourness. This study of contrasts worked out well here, making this a very enjoyable dessert. 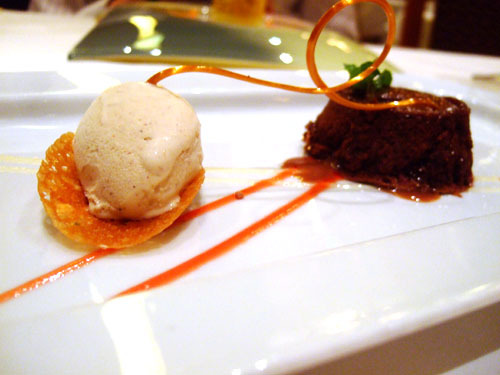 Ice Cream, Orange Tuile. 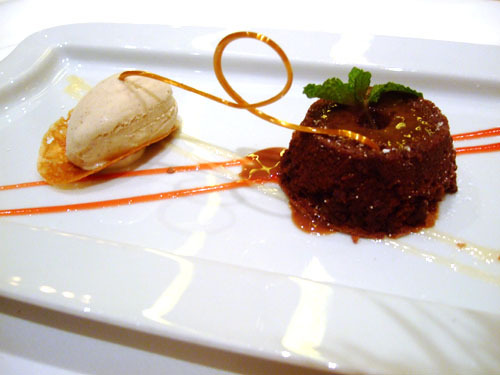 A pretty standard incarnation of the molten chocolate cake and ice cream dessert. Delicious, but nothing special. 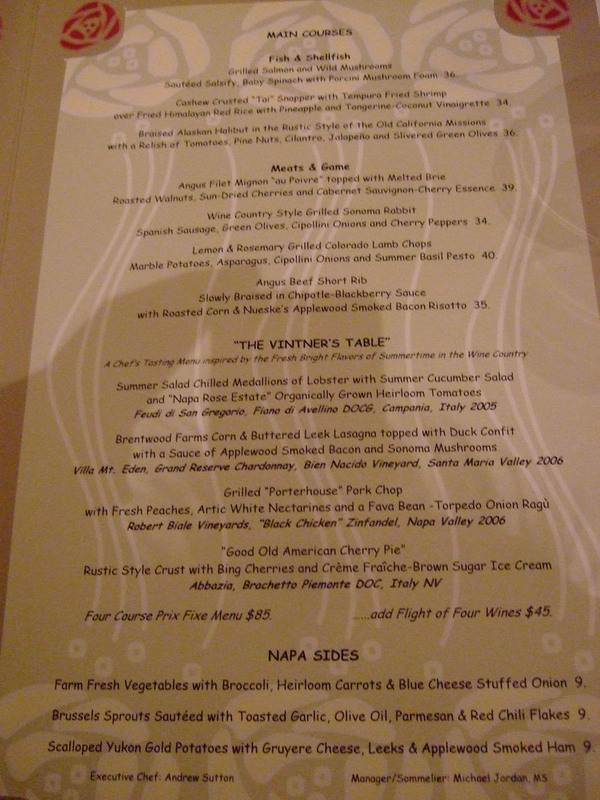 Another visit to Napa Rose, and another good meal. I'm rarely blown away here, but I do always come out satisfied. My third review on what must have been my fourth visit? I suspect there will be many more down the road.